For a budget Photoshop replacement, PhotoPlus X5 ($90, free Starter Edition demo) is a serious contender. And unlike GIMP (free), it's pretty easy to switch to from $700 Photoshop because it's so similar. The How To menu bar in PhotoPlus X5 is a fabulous addition to this complex program. When you've learned how to complete the effect, click back to the table. My favorite feature upon initially opening PhotoPlus is the How To toolbar, which gives you a long list of tips on everything from how to get started to photo retouching to creative effects. If you need additional help, the Help search is also very complete. PhotoPlus X5 makes it very easy to make adjustments to levels, color balance, vibrance and a multitude of other details using a pick-and-click method. Every change you make to your image is stored in a new PhotoPlus layer automatically. In this regard, PhotoPlus X5 is a lot like CameraBag 2 ($29), and it's very cool to be able to make major changes quickly. You can also use PhotoPlus to create Macros of effects and apply them to a batch of images. Unlike CameraBag 2 however, creating macros and applying them to a batch is for advanced PhotoPlus users or those with a lot of patience. Adding and removing parts of your images in PhotoPlus is as complex as you need it to be. PhotoPlus has a built in Cutout Studio, which takes you step by step through the process of isolating part of your image. But more experienced users can achieve the same effects using layers, the magic wand, and lasso tools, as you would with Photoshop or GIMP. PhotoPlus includes a very nifty, simple red-eye remover, which works the same as Xara Photo & Graphic Designer 7 (also $90). I much prefer the default in PhotoPlus for this, which draws the patch over the eye from the edge, rather than the middle (Xara). However, the result seemed more natural in Xara Photo & Graphic Designer, and more obviously a patch in PhotoPlus. I found the tools in PhotoPlus more complex than Xara Photo & Graphic Designer 7, and more likely to not work as you expect. In addition, Xara offers vector-based drawing tools within Photo & Graphic Designer, whereas PhotoPlus is purely raster: just like with Adobe Creative Suite, you need sister program DrawPlus (an Adobe Illustrator clone) to add vector components. 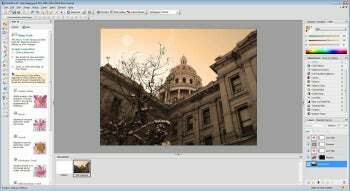 The Photo Organizer, a separate application that comes bundled free with PhotoPlus X5, works more or less the same as Google's Picasa (free). And Photo Organizer is just as frustrating as Picasa if you have gigabytes of images and don't want to wait while the program catalogs your entire collection before you can tell it to stop. However, the organizer is very useful if you have another Serif product like DrawPlus or CraftArtist ($60). Unlike Paint.NET (free), an open-source photo editing tool, PhotoPlus comes complete with all the bells and whistles you would ever need. It's a pretty hefty program that can absolutely hold it's own against budget Xara Photo & Graphic Designer 7, Corel's Paintshop Pro ($100) and heavy-weights like Photoshop. The Starter Edition of PhotoPlus is free, although you do have to register and open an account with Serif. There are frequent popups to upgrade, and just like Serif's DrawPlus X5, the Starter Edition is really a demo and locks you out of many of the best features. However, if you're interested in a Photoshop-like feel without the pricetag, PhotoPlus may be just what you're looking for. PhotoPlus X5 is an image editor with a true Photoshop-like feel without the painful pricetag.